For updates please subscribe to our mailing list. The aim of this thesis is to give a post-colonial reading of selected narratives by Nakagami Kenji (1946-1992). Nakagami was the first Akutagawa Prize winning novelist from Japan’s outcaste Burakumin group. Through the production of narrative about this subaltern community, Nakagami confronted the exclusionary systems of hegemonic Japanese thought and the structures created by these systems which deny the principle and lived experience of ‘difference’. Borrowing the post-colonial concept of ‘writing back’ to the hegemonic centre from the work of Bill Ashcroft, Gareth Griffiths and Helen Tiffin’s The Empire Writes Back, this article will analyse Nakagami’s ‘Misaki’ (1976, The Cape), and its sequel, Karekinada (1977, The Sea of Withered Trees). The principal focus will be on Nakagami’s representation of the hidden voice of those on the margins of Japanese society. This approach will position the Burakumin as ‘subalterns’ to the mainstream Japanese society on the basis of Antonio Gramsci’s view of the group. The analysis of ‘Misaki’ and Karekinada will begin with an investigation of Kishū Kumano as a site on the margins of mainstream Japanese society. In analysing these two novels as subaltern narratives, close attention will be given to Nakagami’s use of intertextuality particularly with oral kishu ryūritan folklore. Study abroad is commonly believed to be an ideal environment for second language acquisition to take place, due to the increased opportunities for interaction with native speakers that it is considered to offer. However, several studies have challenged these beliefs, finding that study abroad students were disappointed with the degree of out-of-class interaction they had with native speakers. It is therefore important to gain an understanding of the study abroad context and the factors that promote and constrain opportunities for second language (L2) interaction. This paper examines the complexities behind six Japanese language learners’ interaction and social relationships with native speakers through analysis of their social networks before, during, and after a study abroad period in Japan. It also compares the networks that were formed in an urban and a regional setting in Australia. The paper concludes with a discussion of the benefits of study abroad and offers several implications for foreign language teaching and study abroad program development. Promiscuous “connoisseurs of love” (irogonomi) such as the fictional Genji and the semi- legendary Ariwara no Narihira have come to define popular perception of Heian period sexual politics; that is, their names have become shorthand for male privilege over women. In this article I will complicate established ideas regarding male promiscuity and privilege in the Heian period through an examination of Tales of Ise, Tale of Lady Ochikubo and Tale of Genji. I argue that, although women’s status as linchpins in the practice of “marriage politics” rarely translated into women’s individual empowerment, men’s reliance on marriage politics placed restrictions on men’s sexuality in ways that are rarely acknowledged by modern scholarship. 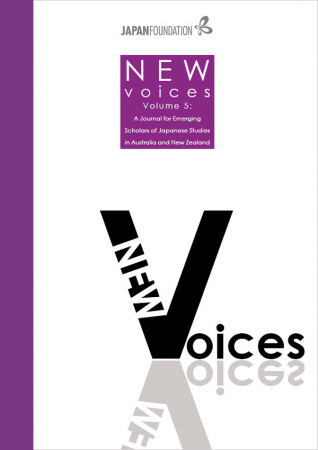 This article examines a new mode of ‘Japaneseness’ emerging through increasing cross-cultural exchanges and interactions since the late twentieth century. Based upon ethnographic data and fieldwork, it demonstrates how Japaneseness is reconfigured through contact with other forms such as ‘whiteness’ within popular commodity culture. The article analyses the Japanese restaurant in Melbourne as an ‘exotic genre’ within which the new mode of Japaneseness is informed and constructed. It argues that this mode of the exotic can be distinguished from earlier formations of exoticism that unproblematically locate a subject monolithically within narrow stereotypes, although the old exoticism has not entirely disappeared. Rather than viewing the Japanese restaurant as a cohesive category, this study conceives of it as a cross-culturally implicated formation that challenges a fixed representation of Japaneseness constructed from a single point of view. This study examines gendered characteristics in four female Japanese language learners’ discourse practices in a communicative setting, where they interact with native Japanese speaking friends in a JFL context. Focusing on the relationship between gender ideologies and discourse practices, I explore the extent to which learners are aware of gender ideologies in the Japanese community and how these ideologies are influential in their discourse practices in the particular setting. In addition, how native speakers of Japanese evaluate gender-differentiated features produced by the learners during the interaction is investigated. Qualitatively-approached, this study revealed that each learner possesses a unique character in their utterances and perceptions, reflecting their individual awareness of gender ideologies and their negotiation of language use against the backdrop of social expectations. At the same time, a lack of such awareness emerged as an issue which kept them from fully and actively engaging in exploring their subjectivities. In addition, this study pointed out that native Japanese speakers utilised gender ideologies as the basis for their judgements on learners’ gendered features in their interaction. This article explores the gender-transgressive expressions found in shōjo culture in order to highlight the potential for feminist analysis in the prevalence of the shōjo motif in contemporary Japanese art. Shōjo culture is a fascinating cultural space, within contemporary Japanese culture, which fosters creative expressions of gender that negate or make complex hegemonic categories. Departing from stereotypes of Japanese girls, this article will pay particular interest to an emerging wave of figurative contemporary art practices in which the figure of the shōjo is utilised for a new generation of feminist critique. Aoshima Chiho, Kunikata Mahomi, Takano Aya, Sawada Tomoko and Yanagi Miwa are among the current artists who feature the shōjo motif in contexts that foreground female subjectivities found paralleled in shōjo culture. These works will then be contextualised in the greater picture of current trends and themes in global contemporary feminist art. This article analyses and discusses what Japanese comical exchange called boke-tsukkomi is like and how it draws laughter. Conversation analysis and incongruity resolution are used as methods for the examination of the boke-tsukkomi examples. This paper will lend itself to further research on the dyadic exchange in the cross cultural context. For calls for papers, new volumes and related news. Published by The Japan Foundation, Sydney.